Actor Matt Damon paid an emotional tribute to the late Robin Williams, crediting him for starting his career. Speaking with Yahoo Global News Anchor Katie Couric, Damon explained that “Good Will Hunting,” which he co-wrote with childhood friend Ben Affleck, would never have been made if not for Robin Williams. Damon said, "Ben and I owe everything to him. He said yes to our movie and he got it made. I could never thank him enough," Damon told Couric. "You know, I look around at the life I have and how blessed I feel, and so much of it started with him." 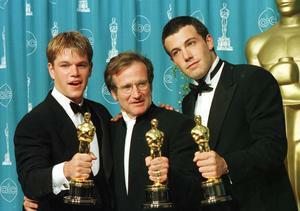 Damon and Affleck went on to win Oscars for Best Screenplay, while Williams won his only Oscar for Best Supporting Actor. Matt also shared memories of how fun it was to work with Robin. "He was the funniest person that I ever met in my life. He was the guy who, when the crew was flagging, he would stop everything and do 20 minutes of standup off the top of his head that literally had everybody on the floor, then be like, 'Okay, let's get back to work.'" Damon talked about regretting that he didn’t stay closer to Williams in the last few years, and how shocked he was by the comedian’s suicide. "I think everyone who wasn't there with him at the end feels bad that they didn't see it coming. I hope I become better at checking in with my friends, and I hope that we as a country get better at checking in with each other, to prevent this kind of thing."